a waste of cash? Our resident trainer separates the good from the gimmicks. Accessories seem to be a part of every woman’s life, and that holds true at the gym as well. One of the things I’m most often asked about as a trainer is weight lifting accessories. Belts, shoes, straps, gloves; which are useful and which are a waste of money? These are important questions because what you wear or use in the gym can not only affect your workout, but also your biomechanics—basically, how your body moves. 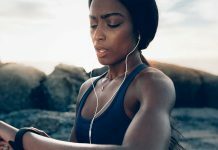 Below is a breakdown of the principles you need to know to get the most out of your fitness accessories, and your workout. The purpose of a weightlifting belt is to help stabilize the spine, and facilitate greater abdominal bracing or tension during heavy lifting. You won’t see any top level lifter lifting without a belt. But (and this is a big but), what it won’t do for you is build core strength in and of itself. A lifting belt will not replace a consistent routine that improves your abdominal and core strength, but when used in conjunction with a strong core, it can definitely help you lift more, protect the back and improve your technique. Straps are used most commonly in deadlifting during heavy, low reps, or sets of very high reps. Like belts, straps are very useful in the right context. While they don’t strengthen your grip per se, they can be used to lift heavier weight when grip is your only limiting factor. However, for beginners, straps are probably not necessary, as the sensory feedback from the hands, and learning to position the wrist and grip is important for someone who is new to lifting. As you start to attempt heavier lifts and grip becomes an issue, straps could be very helpful. There are two types of shoes to consider to benefit squatting and strength training: One is any type of shoe with a hard, flat sole (like Converse), or minimalist quality (like FiveFingers). The other is the kind designed for Olympic weightlifters with a slight heel and velcro straps. Whether or not you can even benefit from either type of shoe depends on your squat style and individual structure, especially if you are a beginner. We all squat with different stances—some wider, some narrower—and different ways of positioning the back. Olympic lifters sit much more upright, letting the knees travel far forward (which a heel can help with), while powerlifters tend to have wider, more hip dominant squats. Unless you are training specifically in one of these two styles, it’s best to pick your shoe based on what helps you train comfortably and progressively. Training in a minimalist shoe with a flat hard sole and enough room to spread the toes is a good idea no matter how you lift. This ensures a solid base and connection with the floor from which to create power. Once you have a feel for your own squat technique, Olympic lifting shoes can also be considered, but, if you’re lifting recreationally or as part of a cross-training routine, save your money. Gloves are one of the most common gym accessories, however they receive the least support from me. Gloves for lifting are similar to shoes; they cover a very important part of the body that contributes to motor learning, technique and sensory input. If you are starting to lift, chances are you’re concerned that your hands will get sore, rough, and develop calluses (and if you’re doing it right, they will). But, gloves can actually be more of a hindrance than a benefit to your progress as they create a barrier between you and the bar. While your hands might get tender when you first start out, lifting barehanded will improve your grip strength, coordination and technique. So what if you have a few calluses when you’re strong?